tmp answered so quickly I have deleted the message, I will be contacted when it's my turn to pay. I tried too hard looking for an address etc that I didn't read fully, the thread and excitement are so great, that re reading it all is a big task! This is big winner in the cart offerings realm! Thanks for such a wonderful offering! Edited by _The Doctor__, Wed Jun 20, 2018 10:37 AM. I am trying to send payment but I am thread blind, can find pay pal email address.. I'm sure it's posted some where I just can't seem to catch it. tmp, It looks like your cart is going to be such a great success, you may need help to meet the increasing demand! I see many people excited as the capability of the cartridge and it's firmware continues to expand. Great team, great work! 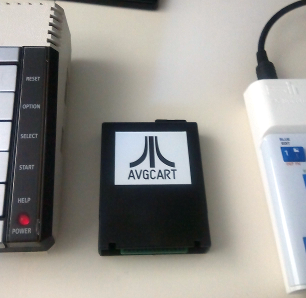 Having been experimenting with the UNO Cart, I would be interested when the firmware is likely to become open source in order to learn if similar things will be possible with the AVG Cart? As these demos are written mainly in C, I should hope they will port over easily enough. Edited by ivop, Wed Jun 20, 2018 11:07 AM. Edited by Wrathchild, Wed Jun 20, 2018 12:15 PM. from Wiki - "The Super FX was so much more powerful than the SNES's standard processor that the development team joked that the SNES was just a box to hold the chip." ...and hopefully the same with the AVG Cart? I asked if he'd sell him a bunch and he said: "Sure". I've asked him how many he's willing to sell, which colors he still has and what the price would be. After he said: "Sure". That was not even 24 hours ago. You get any follow up Mathy? Edited by tmp, Thu Jun 21, 2018 5:52 AM. Disabling the ATR Swap button should be all that's required to allow emulated cartridges to work. Certainly it's all I had to do when testing my UNO cart firmware modifications (it was possible to use the emulated cartridges alongside the PBI HDD). So, disabling the ATR swap button is a required step to enable your selector menu to boot (since enabling it suppresses cartridges at the CPLD level), but it should also allow unimpeded access to emulated cartridges (at least any which aren't deactivated by the PBI BIOS writing to $D5Fx). I've tested MaxFlash 1Mbit and various OSS cart images using the UNO implementation, and those carts at least didn't mind writes to $D5Fx being filtered out and redirected to the HDD registers. Edited by flashjazzcat, Thu Jun 21, 2018 6:51 AM. remember that narrow mode loader I was going on about for cart pass thru loading.... would an idea like that keep from perturbing the pbi bios? silly thought, but a possible but slower work around? for certain troublesome cases? Edited by _The Doctor__, Thu Jun 21, 2018 11:23 AM. Too abstract for me to understand today, I'm afraid. What exactly are you talking about? Disabling the ATR Swap button should be all that's required to allow emulated cartridges to work. Does this work with the original bios or only your updated one? The behaviour is part of the CPLD logic on the U1MB board, so it's always worked this way. But since the HDD driven by the PBI BIOS had hitherto only existed on a cart (SIDE) which does not emulate cartridges, there was never previously any real point in disabling cart suppression. This changed with the 1088XEL (the default "button" mechanism is always suppressed there in order to allow external carts to work, the HDD commonly being the XEL-CF decoded on page 0xD1) and latterly with AVG and the custom UNO cart firmware I'm working on. In these circumstances, disabling the ATR swap button in the setup menu is necessary for the cartridges emulated by these two devices to show up. Neither AVG nor UNO have any method of taking advantage of the default "swap" mechanism, and XEL-CF 3 has its own discreet ATR swap button, so disabling the ATR swap mechanism in order that carts may work is no great loss. oh that's interesting... maybe that second button on the avg cart could be mapped to a more discreet and compatible swap function the typical swap d1: d2: or roll d1 thru d4: ? I received a message from Steven Tucker today. 100 cases would cost $ 4.40 each. Plus shipping. Colors available: red, light clear blue and neon clear green. "They do not fit the same style pcb used in the brown Atari made casings"
The PBI BIOS already rotates every mounted ATR in the first fifteen drive positions (the maximum currently supported anywhere) when the button is activated, so once it's implemented on the cart, it'll just work (though carts and ATR rotation would remain mutually exclusive without alterations to the PBI BIOS, which can't currently recognize AVG as a distinct piece of hardware, since the AVG impersonates a SIDE2, but with the button inactive). That should all work perfectly well. I have emulated carts running with low-level SD card access via the modified UNO cart firmware here, and an SDX image loaded from the AVG cart should be able to access the SD HDD via the SIDE.SYS driver. This allows - in both cases - cart emulation, XEX loading and APT hard disk operation on stock machines, and cart emulation, XEX loading, APT hard disk and ATR mounting on an U1MB machine, all via a single cart solution.